Does this look like LATE BLIGHT? But today, I noticed the black/brown on the stem. This had been less serious looking before and I thought it was just the string rubbing in the stem. -- I'm thinking the damage to the fruits are not exactly like LB.... But I've only experienced Late Blight in my garden once before.... It would be an extremely rare occurrence here. Re: Does this look like LATE BLIGHT? Not sure what the term is - perhaps late blight is it - but they look like how some of my tomatoes look when it starts to get cold in the fall, when the season has ended, they are the tomatoes that didn't quite make it, they didn't ripen. This is when I become frustrated and have a tantrum and swear that I will only grow Early Girls in the future. I don't know for sure and I (fortunately) have never seen late blight in my garden. but unfortunately it was just labelled "insect damage on tomatoes." Yeah. I'm not really sure either. Only report of late blight is in northern NJ in July, and not anywhere near here in the surrounding states according to this map: http://www.usablight.org/map ...also confirmed by searching for any news reports. I think just to be safe, I will pull this one plant and dial up the preventive spray program with AACT, Willow tea, nettle leaf tea, comfrey tea... If I was keeping this plant, I might spray it down with something stronger -- more of a fungicide -- first, then apply plant health boosters and increasing the phyllo sphere foodweb biodiversity. If it is late blight you will know for sure in a few days. Late blight untreated will mean a very quick death to your plants. Rouge it out quick so not to infect all your plants. Sun scald will turn the fruits whitish first and then the rot will set in. With so many funguses (fungi?) late in the season it may be several things. I agree to use a fungicide on the other plants. Be sure to notice the safety label for harvest precautions. Good luck. It could be a number of bacterial or fungal diseases. Late blight is possible, but also because your stems are also black and the lesions are sunken and on the stem end instead of the blossom end, it may be alternaria. You should destroy the infested plants and sanitize as much as possible. You may have to change your planting location and not plant any solanaceous plants in that spot. I agree if it is late blight you will find out quickly. I doubt it, as I think you would see the foliage get infected first, and there is no recently reported LB in your area. Good luck with the plants! I agree with Imafan. With the wet, cool summer I'm seeing some of the same signs but it is not killing the plants off. More like a slow septoria decline. I have also noticed that it seems to happen worse where I used sawdust. It seems to keep it too wet and maybe promotes fungus/bacterial wilt. I also notice a lot more fruit flies/gnats this year the seem to ruin the fruit once they get in a crack. The wet sawdust is ideal for them as well. The sawdust worked well for me last year but I have had all kinds of problems with it this year. I lost a whole row of pole beans to what appeared to be damping off. This was before the floods in ideal weather. It seems to hold too much moisture and doesn't breath. Thanks for your insights, comments, and advice. I'm definitely going to keep a close eye on the rest, but I'm feeling better about this thing. Some photos look like bug damage, worm damage and sun burn. 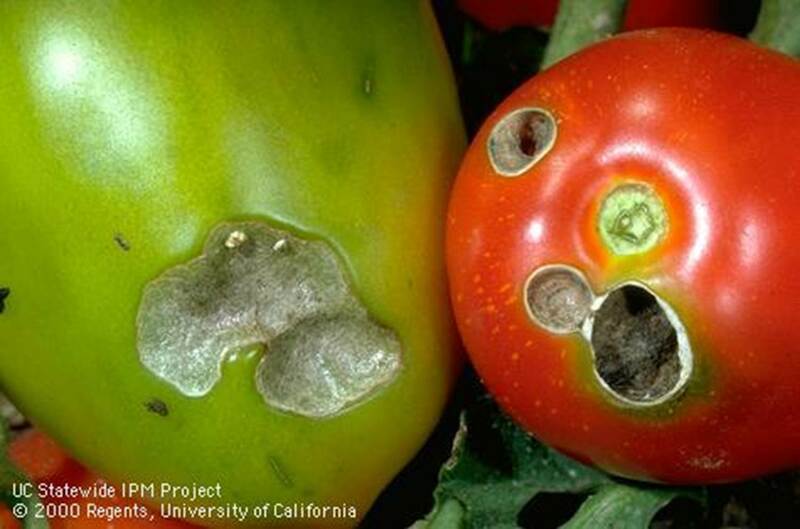 Blight usually effects the plant and leaves before it effects the tomatoes. 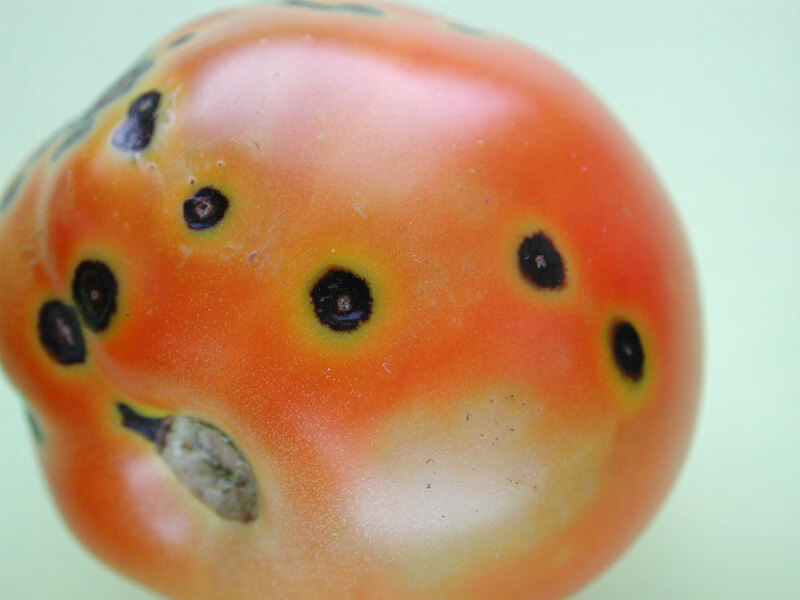 Tomatoes get ripe then lots of bad spots then rot. Pick tomatoes early eat before they go bad. Blight usually runs in cycles we had blight from about 2007 to 2012. Copper sulfate and lime when you plant is good to prevent blight. Late (or later) season blight?